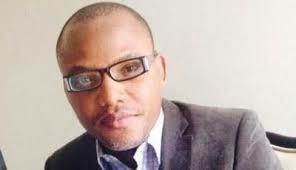 The Unlawful arrest and detaining of the Leader of the Indigenous People Of Biafra and Director of Radio Biafra/Biafra Television MAZI NNAMDI KANU, by the Nigeria Islamic Department Of State Services (DSS) at the order of the terrorist President of Nigeria Mohammadu Buhari,is an arrest on the Freedom of the Indigenous People and Violation of the Human Rights of Biafrans. The leader of The Indigenous People Of Biafra was unlawfully arrested by the Nigeria Islamic Department Of State Services in his Hotel Room at GOLDEN TULIP ESSENTIAL AIRPORT HOTEL,42/44 MURTALA MUHAMMED INTERNATIONAL AIRPORT ROAD,IKEJA LAGOS. 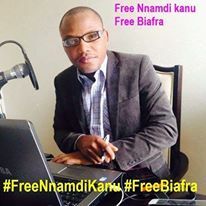 Mazi NNAMDI KANU is a BIAFRAN FREEDOM FIGHTER agitating for his freedom and the freedom of Biafrans who are unabatedly undergoing Mayhem, Terror and Death in the contraption of the Islamic Government of Nigeria. He is a Law abiding Freedom Fighter, who has no trace of Criminal or Terrorist record, thus has not be accounted for any Crime. Biafrans were forced into the concoction and contraption called Nigeria by a British resource exploiter called Frederick Lugard in 1914 who in his statement said; "NIGERIA AND BIAFRA ARE OIL AND WATER THAT CAN NOT BE MIXED AND CAN SEPARATE AFTER HUNDRED YEARS OF THIS UNION". From the amalgamation of this concoction and unholy union in 1914 upon till today, Biafrans have been subjugated and subjected to Servitude, Poverty, Mayhem and Unlawful Killings by the Islamic Government of Nigeria. Over Six Million Biafrans were killed during the Nigeria-Biafra Genocidal War in 1967-1970, when Biafrans seek for Freedom and declared the Independence of Biafra. The Unlawful arrest of the Indigenous People Of Biafra is intended to stop the agitation for the restoration of Biafra and as well expose the un quenching quest of Nigeria Islamic Government to stop the Freedom of speech of Biafrans as the Truth is been exposed daily via Radio Biafra/Biafra Television. This unlawful arrest is an infringement of Human Right and a Violation of The United Nations Declaration on the Rights of the INDIGENOUS PEOPLES adopted by the United Nations on September 13, 2007 which constitute the dignity and well-being of the indigenous peoples of the World. ARTICLE 3 of the United Nations Declaration of Rights Of The Indigenous Peoples(UNDRIP'S) of the 46 articles recognizes the Indigenous People's Right to self-determination, which includes the right to "FREELY DETERMINE THEIR POLITICAL STATUS AND FREELY PURSUE THEIR ECONOMIC,SOCIAL AND CULTURAL DEVELOPMENT". ARTICLE 4 affirms Indigenous Peoples Right "TO AUTONOMY OR SELF-GOVERNMENT IN MATTERS RELATING TO THEIR INTERNAL AND LOCAL AFFAIRS". ARTICLE 26 states that "INDIGENOUS PEOPLES HAVE THE RIGHT TO THE LANDS, TERRITORIES AND RESOURCES WHICH THEY HAVE TRADITIONALY OWNED, OCCUPIED OR OTHERWISE USED OR ACQUIRED". 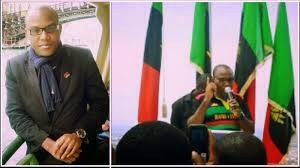 This commands every State including Nigeria, to legally give recognition of Biafra as a Nation. The International Magna Carta for all mankind adopted by the United Nations states that "DISREGARD AND CONTEMPT FOR HUMAN RIGHTS HAVE RESULTED IN BABAROUS ACTS WHICH HAVE OUTRAGED THE CONSCIENCE OF MANKIND AND THE ADVENT OF A WORLD IN WHICH HUMAN BEINGS SHALL ENJOY FREEDOM OF SPEECH AND BELIEF AND FREEDOM FROM FEAR HAS BEEN PROCLAIMED AS THE HIGHEST ASPIRATION OF THE COMMON PEOPLE". The hypocritical and terrorist President of Nigeria Mohammadu Buhari in his United Nations Speech stated that; "THE WORLD DO NOT HAVE THE MORAL RIGHT TO DENY ANY PEOPLE THEIR FREEDOM OR CONDEMN THEM INDEFINITELY TO OCCUPATION AND BLOCKADE. INTERNATIONAL COMMUNITY HAS NO EXCUSE TO CONTINUE TO DELAY IMPLEMENTATION OF UN RESOLUTION ON SELF-DETERMINATION FOR PALESTINIAN PEOPLE". This same hypocritical President of the contraption called Nigeria who pretended to be agitating for the freedom of Palestinians, has unabatedly unleash Mayhem, Terror and Violation of the Human Rights of Biafrans and as well ordered for the unlawful arrest of Biafra Leader. The Unlawful arrest of Mazi Nnamdi Kanu might result to another Genocidal experience in Nigeria, as Biafrans will not condole this unlawful arrest and subjugation of their leader. Biafrans therefore, call on the World to let Justice prevail.